For us success means to hand on our enthusiasm for the tennis sport to all those interested at all age groups. Thereby our success becomes your success while always focusing on having fun. Our youth coaching courses are offered to kids and young adults at the age of 6 to 18. The group division is being done by the coaches and takes into account age as well as strength of play. The courses are taking place throughout the year and are being conducted by our licensed coaches. Here as always not only the training effects of coordination, improving shape and game play are being focused on but moreover the aspect of having fun while playing. That is why during all courses tools such as pylons, ropes, coordination ladders, hoops and others are used in order to enhance the quality of training. On top our coaches impart their knowledge of rules to the kids. Our kids coaching starts at the age of 4 until about 7. To allow kids a smooth start we are using balls with reduced pressure, smaller courts and lower nets. The grouping here is also done by the instructors and takes into account age as well as experiences. 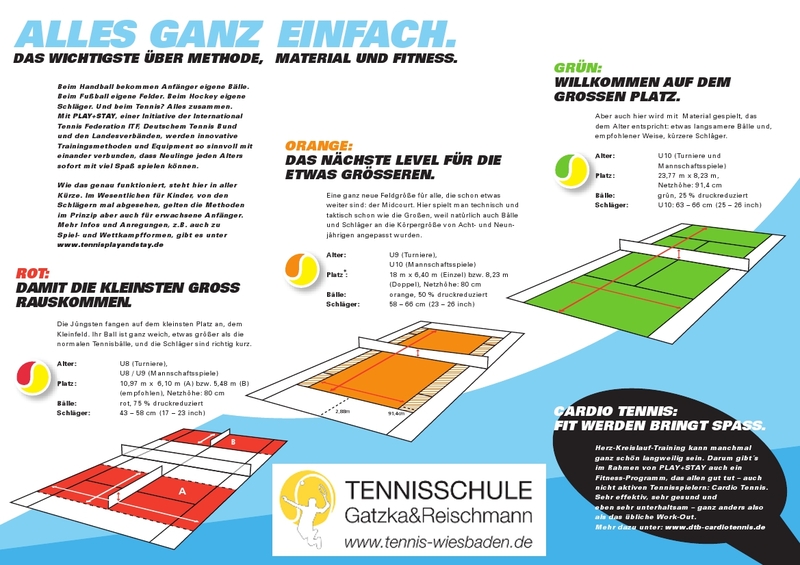 Here we follow the concept of the 10-hour program of the Hessische Tennis Verband, ﻿Play&Stay of the Deutsche Tennisbund and the Tennis10s of the International Tennis Federation. This way kids gain an understanding of the game of tennis in a playful way. The use of methodical tools such as small court nets, balloons, kid’s balls, hoops, ropes and pylons makes it possible for the kids to learn with age-appropriate equipment while having lots of fun. For adults we offer beginners as well as ambitious players a well fitted and modern tennis training. We are offering beginners a hands-on approach in order to quickly progress while having lots of fun. Of course we also provide individual tennis lessons for adults. In one-on-one lessons, partner or group lessons beginners and advanced players can strengthen their abilities and learn new skills. On top we offer individual tournament assistance as well as match and video analysis with the relevant assessment. Our range of coaching also includes the program “intensive tennis”. Here we provide an intensive weekend or daylong tennis workshop that obviously focuses on tennis but moreover boosts the individual fitness of the participants. All prices include value-added taxes. During the winter season we have to add the fees for indoor courts. For individual coaching lessons you may contact us here.